For the Aho family, camping goes hand-in-hand with adventure, running competitions and nature. From their campsite, they set off for an intensive day mountain carting down steep hills, visiting the country’s largest waterfall and running in the mountains. The Aho family from Hallstahammar appears on the surface to be a completely normal Swedish camping family. Three children, a station wagon and a caravan that roll through Sweden during holidays. But appearances can be deceiving. “In the winters we take the caravan on ski trips. We primarily got the caravan so we could go to our activities. We’re not like other camping guests in that respect,” laughs Jenny. The Aho family did not come to Åre Camping to relax at the campsite. Relaxation may be important, but they prefer an active holiday. Running, adventure-filled excursions and races fill their days. Dad Janne has previously completed the incredibly difficult Courmayeur-Champex-Chamonix Ultra Marathon, commonly known as “The CCC”, an adventure through the peaks 2,537 meters above sea level. Here in Jämtland he is participating in the Åre Mountain Marathon. It might be a lot easier, but it is still 43 km of challenging terrain. 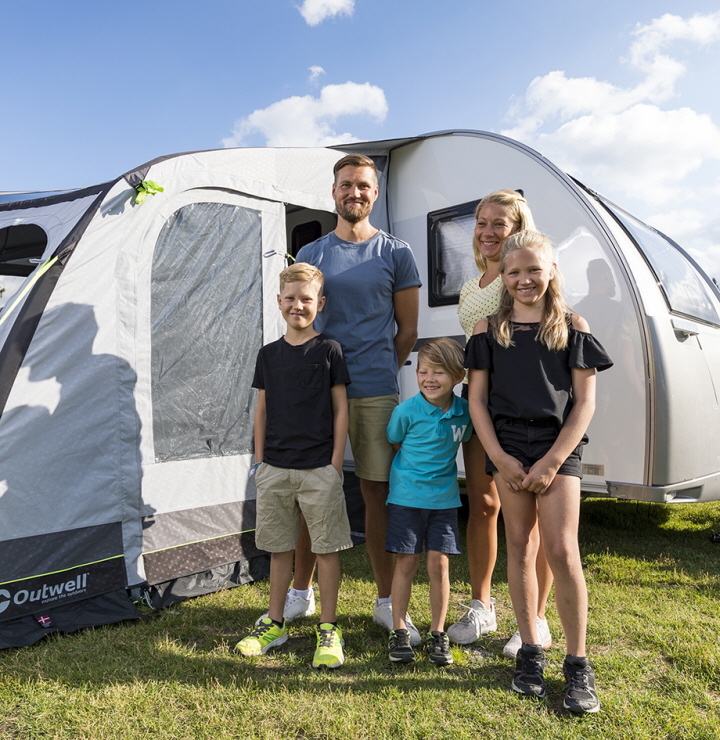 It is no wonder that their camping holiday does not exactly revolve around barbequeing and cold drinks. “I have already done all of the 100-mile races in Sweden, so I am hoping to keep up a good pace here at the Mountain Marathon,” says Janne. With a few weeks on the road behind them, the mood is lively. The children – Ellah, Wilmer and Charlie – show no signs of discontent. Instead, they are all about ice cream, running and laughing. The interest in activities that require fast shoes appears to have been inherited. At home, Ellah and Wilmer have already begun to participate in running races and orienteering. Ellah was scolded at school for having run too far during a field day. “But they said we could run as far as we wanted,” she explains, smiling. On the day that we meet, their schedule is pretty empty. Jenny will be competing in the evening in her first race ever, the Copper Trail 7K sprint. The race is described as a charming loop, and it is also an entry-level race to attract new participants to mountain running as a form of competition. “The height in the terrain changes a mere 400 m and the race is only 7 km, but it will be fun and exciting,” says Jenny. For a newbie, this is surely a challenge in and of itself. There are still several hours to go until the race, and beautiful Åre is offering up sun and no wind. Over the past ten years, Åre has really developed into a mountain destination. There was a time when its only offering was skiing, but it now has activities all year long. Hikes and running in the mountains attract many visitors, but there is also a well-developed trail system for biking – and more exotic activities such as mountain carting. The family decides on the latter, which means three-wheelers with gravel tyres built for going off-road down Åreskutan mountain. The back tyres brake individually so the carts traverse down gravel roads and paths. The excursion is led by a guide from Explore Åre. After greeting one another and going through the introduction, each family member settles into the lift chair with their cart and rides up Åreskutan. A first test-run goes from VM6’s top station down to the next stop, Hummelliften. They then speed through tunnels and down more technically challenging paths. Ellah and Wilmer get to ride by themselves, but Charlie rides with his dad. “He is laughing and steering in the wrong direction, so it was both fun and exciting,” laughs Janne. The whole thing takes a few hours, and it feels perfect. Then lunch and a quick break. But the family wants more adventure. They jump into the car for a 20 km ride to the west to see the unbelievably beautiful Tännforsen, Sweden’s largest waterfall. 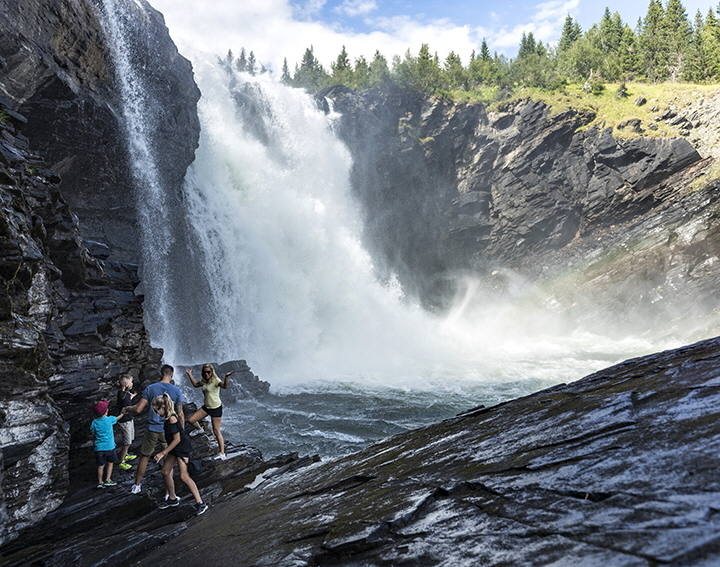 There is a restaurant, a café and a few kilometres of prepared paths that lead to the impressive falls. As can be expected, the Aho family get as close as they possibly can, right under the 37-meter-high falls. It is a magnificent experience. The water slams down only a few metres away. It thunders and roars. The moisture in the air is tangible, and it is like standing in a light rain. A very close interaction with nature, which even the children appreciate. The clock ticks onward and it is soon time for Jenny to prepare for her race. The family returns to the campsite, and Jenny heads out on a short run to warm up. Later, we hear that Jenny finished the race in under an hour, and Janne ran the Mountain Marathon in under five hours. “We both met our goals,” says Jenny happily. As the summer draws to a close, new adventures await. The family is discussing parking the caravan in the winter at Ånnaboda Storstenshöjden, a mountain offering nine downhill slopes that is only an hour away from their home. An easy choice when free time equals activity time, rather than couch-time.